Well, it's no secret that I love Jennifer Echols. (Haha. See what I did there? Like the title? Okay, never mind. Bad pun.) I don't read tons of contemporary books, but hers have always been a favorite of mine because they're so raw and real. 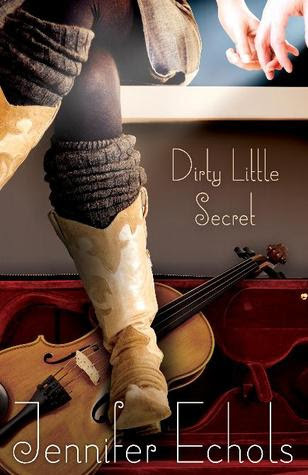 Dirty Little Secret is no exception. Jennifer Echols has done it again! I was especially excited for this book because it's about country music, my absolute favorite music genre ever. I'm from the South, so I've grown up listening to country music. And it was so so so fun to read a book about it. I mean, how often do you read a YA book about country music? It gives this book a unique feel, which I loved. It's hard to make contemporary books unique, but this one definitely is. I really loved Bailey's character. She's very tough and independent. I loved her journey as she slowly began to forgive herself and her family and learned to start opening up her heart again. Sam was so great as the love interest. I was afraid he'd be a clichéd bad boy, but instead, he's so genuine and sweet and adorable. I think I've found another book boyfriend. :) Oh, and he names his band Redneck Death Wish. Love it. The minor characters were also fantastic. Like Charlotte, Sam's ex. She surprised me by being a character who is truly hurting and trying to find her way, and I ended up loving her character arc. I also love the way Echols makes all her character stick out with their quirks - for example, Bailey has a habit of rubbing her eyes a lot. Little characterizations like this made each of the characters unique. And the writing is amazing. One of my favorite scenes is when Bailey performs for the first time with Sam and his band. Echols captures the feel of this scene perfectly - the crowd's raw excitement, the sound of all the instruments, and Bailey's surprise at how much she's enjoying herself. This book just totally represents the spirit of country music. I would absolutely recommend this book. Whether you like country music or not, you'll end up being sucked into Bailey's story. Dirty Little Secret is a wonderfully original YA contemporary and the perfect summer read. "I like doing things that make me uncomfortable. I try not to have a comfort zone." * I received a free copy from Netgalley in exchange for an honest review. Thanks!